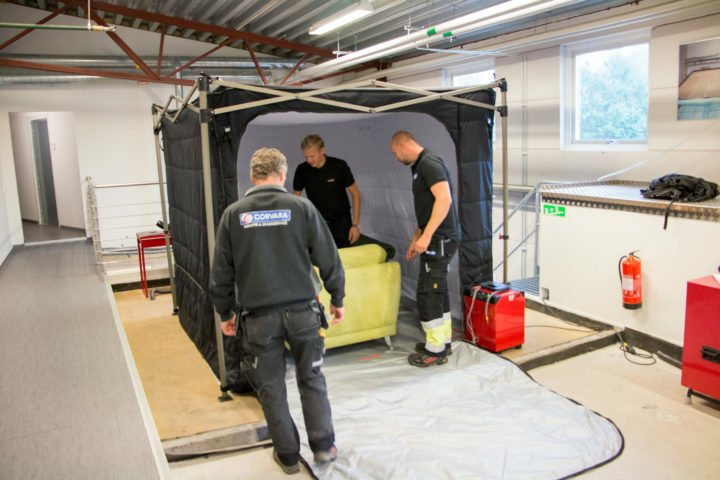 The damage restoration company Corvara has spent 1,5 years working on bed bugs sanitation in Oskarshall, a former accommodation for newly arrived refugees in Jönköping, Sweden. After close to 200 treatments, the building is finally free from pests. The municipality contacted Corvara during spring 2017 and mentioned that they suspected bed bugs. During the past months he has been working intensively with bed bugs sanitation and says that he realized that a heating system is what’s needed to succeed with this difficult task. They started by decontaminating one of the corners and has thereafter worked throughout the whole building with heating treatments during the days and some nights. Everything from furniture, suitcases and other textiles to refrigerators needed to be decontaminated. “You cannot exclude anything at that stage”, Johansson claims. 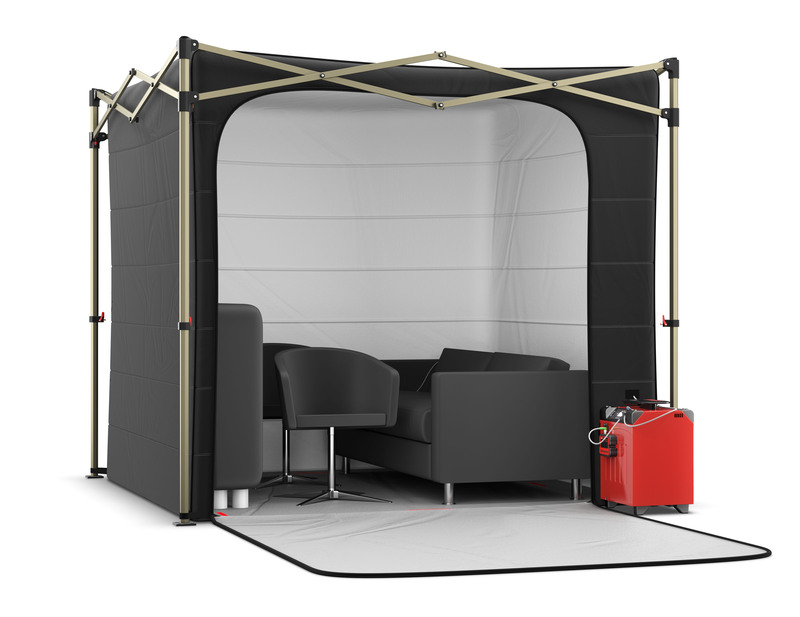 To decontaminate movables with an insulated tent and adding heat is a modern method that is becoming more common. Methods including chemicals and gas treatments were previously used to poison pests but many of the older methods are no longer allowed from a health- and environmental standpoint. Due to the fact that no chemicals are being used with Corroventa’s solution, it is a simple and more environmentally friendly method. Andreas Johansson says that you learn step by step how to place the things and the sensors right to get the temperature to rise quickly. They have used e.g. coat hangers and wire baskets to get a better circulation of the warm air. 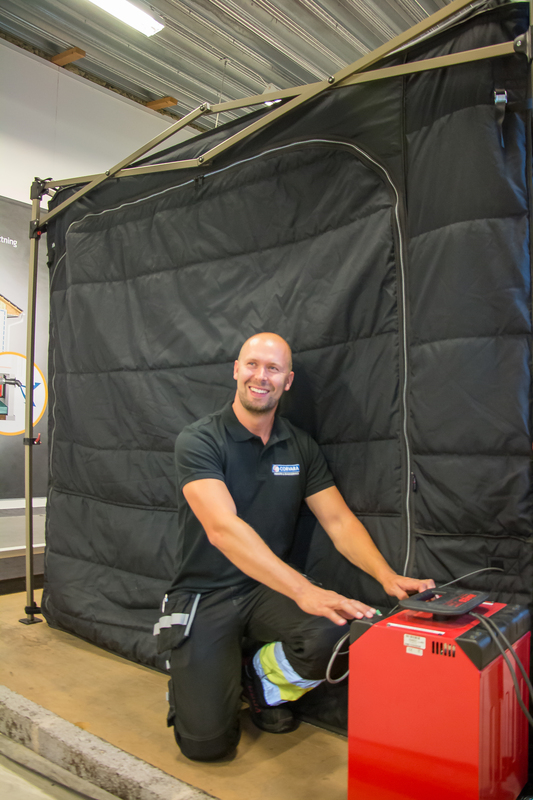 Corroventa’s method for bed bugs sanitation includes a H4 ES heater, with remote control through SuperVision®, sensors and an insulating tent with accompanying floor insulation and tent frame where you place the furniture and other movables. The system has few components and is therefore simple to both set up and use. The insulating tent and its case have been designed to ensure maximum discretion, with hotel guests and neighbors in mind. The system’s effective heater will raise the temperature in the tent where the treatment occur. It is the high temperature that kills the pests. The method is not only reliable and efficient to reach a result. The whole system is also designed to minimize energy consumption and rationalize operation with automation and remote control. Rapid bed bugs sanitation due to the double boost effect and the well-insulated tent. After-cooling: Once the process is complete, the fan continues to run for an additional hour in order to steadily reduce the temperature. This helps to protect furniture from the effects of a sudden change in temperature. With SuperVision® the process can be controlled, monitored and checked remotely using a computer, mobile phone or tablet. This enables considerably more assignments to be carried out simultaneously, while reducing the amount of travel engineers are required to do to monitor the process on site. SuperVision® gives total control of the sanitation process and saves time, money and reduce energy consumption at the same time as the process is being documented. Kjell Wallin and Andreas Johansson from Corvara are going through the heat treatment process for bed bugs sanitation together with Karl Jansson from Corroventa. Andreas Johansson from Corvara was the project manager for the bed bugs sanitation project at Oskarshall in Jönköping.